Something very interesting I got to read in TOI portal today. While answering a PIL filed by Sanjay Kulshresta, the government for the first time agreed before the apex court that how the present UPA and all the previous Congress governments put together are incompetent and inept. Though never expected of a political party which survived solely on lies, divisive policies and gimmickry; the present day corrupt government for the first time in its entire period of existence admitted to some facts and truths. Now here is the thing. The affidavit revealed that during 1997-2002 (ninth five-year plan), when the NDA was in power, 23,814 km of national highways was added to the existing NH network. That is roughly about 50% of the total highway that we have added to our kitty in last 32 years. Here I see two interesting things. First is to note the amount of work an elected government can accomplish, provided there is a conviction and determination there for it. Not to forget, how corruption affects everything in our country. 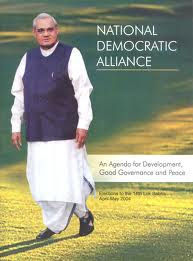 Second interesting thing is the manner in which a corrupt government was forced to accept and admit facts that highlight the golden governance the nation saw under Atal Bihari Vajpayee. While going through the article, along with NDA's good governance proofs I noted another fact (admitted by the government) that reflects the manner in which the Congress party plays it's vendetta politics; even in matters of national infrastructural mission. Though it is well known a fact that Congress’s core ideology was always to keep dividing the nation on various parameters and keep ruling and looting, I never expected them to do the same with matters that directly deal with national growth. The apathy of Congress party towards all non-congress ruled states is anything but known but never thought it to be so rotten and dirty; even for matters of national interest. Here is the line straight taken from the article. During 2012-2017, nearly 3,000 km of additional national highways was proposed to be built but the government decided to de-notify 530 km of national highways in Madhya Pradesh and 627 km in Gujarat. I could be wrong, but I smell stinking politics in any such decision. The de-notification of the proposed plan looks more on political ground than technical. For I know, it is not the government but the national highway authorities propose new highway corridors for growth. And they certainly come up with their proposals after thorough study of various factors. From vehicular numbers to prospective business development; all are taken into account before NHAI rolls out their proposal. Now this arise a very fundamental question – What knowledge does the government, full with corrupt people have on highways to go ahead cancelling the proposal of experts? Was the original proposal so school boyish that even the worthless colony of politicians, those crowd this government could see it? Was there something so utterly awful in the plan which the experts couldn’t manage to see but the thugs in Congress could? Could be there, we don’t know. But what we do know, it is Gujarat and Madhya Pradesh, the only two states which saw the axe. And that’s where it starts smelling fishy. Both these states are ruled by BJP and that too with thumping majority. To make the matters more interesting, both these states have reelected the incumbent on the grounds of development. Even the prospect of Congress to comeback to power in these two states in near future is anything but a matter of miracle only. Now how Congress, which never believed in a developed India counter two gentlemen who talk only the language of development? You couldn’t have guessed it better; try putting hindrances in the development mission of both these states. Hindrances so meticulously placed to make it look like a deficiency with the state government which later on to be cashed on by people like Rahul Gandhi standing atop a podium and vouching for development. This is exactly what the Congress as a party is doing since independence. To hide their own dirt they conveniently try to project the opponent as dirtier. And how exactly they do it? Correct; by installing suitable deterrents and then projecting them as the state’s inefficiency. The apathy of this Congress government in particular for highways or any development projects was always evident. Hope the nation shouldn't forget the ugly spat between planning commission chairman Monteksingh Ahluwallia and the then minister of road transport and highways, Kamal Nath. When Kamal Nath was fuming against the planning commission for not supporting his aggressive goal of building highways, what Montek said in response is there in the public domain for all to hear. ‘We don’t take advisory on how to run the nation from road contractors’ is what Montek is alleged to have said. That sets the tone for priority, as far as this corrupt government is concerned. All that they always wanted is not real growth of the nation but distributing freebies through popular social schemes. They always wanted the masses to remain fool so that they can enchash their political ambitions by rolling out drools in regular interval. MNREGA is one of such public money wasting extravaganza aimed purely at votebank by cashing on the poor. Had the same money been invested in building infra projects we would have been far better placed than what we are now. But that’s what the Congress never wants to happen. For them development is a word only to be spoken atop podiums during election rallies while in reality they want the nation to remain as underdeveloped as possible. A vibrant and developed India will actually spell doomsday for many in Congress; starting with Sonia Gandhi and down. Could a party of crooks thriving on by exploiting the poor afford such ultra-development of the nation? If the poor are elevated, how it would be possible for them to shout ‘Garibi Hatao’ nonsense that they are doing since last 50 odd years? Though the government shamelessly admitted their incompetence before the courts, the revelation didn’t come as a surprise to me. In fact I was rather surprised to see just 50% attributed to Vajpayee’s good work while it always looked like more than 70%. But I still give it to this pathetic government. To think about development you need to have time at your disposal. In these 10 years, all that this government has done, is either looting the nation or defending the loot and looters with their lives at different stages of investigation. And whatever time left after this loot management, it was invested in maligning Narendra Modi by different ways and means. That said, one thing this government can still do, if they are left with even an ounce of shame. Now that they have admitted the real architect behind such massive NH development work across the nation, they at least should name the golden quadrangle on the man who made it possible; the one and only Atal Bihari Vajpayee. We have these fake Gandhis and thousands of stuffs named after such worthless entities without any contribution; now lets have something named after it’s true mastermind. Hope enough shame is still left with these Congress stooges to do justice to the rightful person. Modi's popularity is being shaped up by the private firms he has shown favor, in fact Modi is not bothered or interested about becoming PM, he is unfit for the post as he knows only to privatise services and give freebies to them. Modi has made Guj. the third most debt state in India, Maha has 10 times FDI compared to Guj., but no congresswala goes and tells the world that Maha is is no.1 FDI destination, however Gujju Bhai NRIs project 1/10 FDI as India's greatest state !!! The extremist Hindus, RSS and Gujju Bhai NRI want Modi not be hanged, so they are confusing authorities by projecting his fake fame and possible PM candidature. The courts normally may not punish person who can polarize people mentality as it may lead to communal violence. But when his fake popularity comes out , the courts will nail Modi and may be hanged immediately. BJP and extremist hindus are busy avoiding this scenario as Modi is the single most contributor to BJP coffers. However in next few months it will be clear about Modi's gallow days for his crimes on innocent women and children of India. Uppercaste propaganda is spreading false picture of Modi and Gujrat, but sadly truth will come out and Modi will be hanged without mercy. Just google "India GDP" and see the slope of curve of GDP dueing last one decade ?? It's the best phase in India's history.....judge the curve and Congress and NDA ....curves don't lie !!! UPA1 and UPA-2 have done superb balancing act and the same time propel India at the fastest rate in it's history !! Food security, RTI, MNREGA, Women empowerment, 16 flagship programs for poorest, reduced teror fatalities, improved and matured governance, increased computerization etc etc are highlights of Cong. NDA gave benefits to only private companies and people at bottom didn't benefit at all. The poverty reduction rate is highest in India's history during UPA. Your comment shows that you have an agenda to divide India. You have taken caste as a tool for dividing the country.